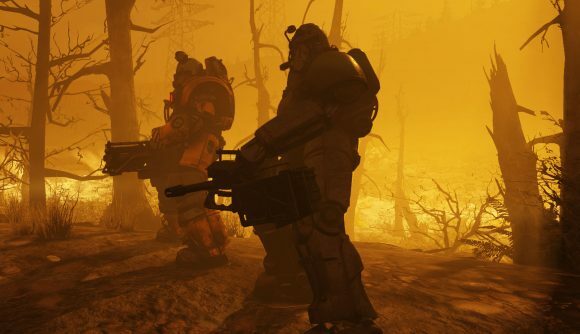 Over the past few months, Fallout 76 players have found ways into a secret developer area filled with hidden items not intended for the public, including cosmetics and weapons that haven’t yet been released. (And the human NPC Wooby.) Bethesda has been issuing automated suspensions for accounts which got inside, but players were still able to offload the loot onto other accounts. Now that door is closing too. Bethesda is issuing temporary suspensions for accounts which have those items, according to the game’s Polish Facebook page – as translated in a further report by Eurogamer. That statement says that “these areas are only accessible to PC players that are using 3rd party applications,” so it seems we’re looking at active attempts to hack the game rather than normal glitches and exploits. The location of the dev room has apparently been shifting, though parts of it remain accessible according to Eurogamer’s sources. Exactly how Bethesda has been tracking down the illicitly obtained items is unknown. It would likely be easy enough to ban accounts with pre-release items, but we don’t know if standard items in the game have any sort of ID that could link them back to the developer room. While some players will certainly find joy in circumventing the economy of any game with microtransactions, Bethesda’s desire to shut down hacks is certainly understandable, especially as features like player vending start to be implemented. Post-apocalyptic West Virginia might be a lawless place, but we do need some semblance of order in our online gaming. If Fallout 76 is going to grow beyond its rocky launch, these things need to get fixed.